Workshops explore different themes through discussion, interactive activities, art practice, and silent meditation. 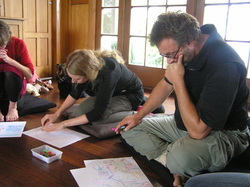 Workshops to date have been held in Wellington, Golden Bay, Auckland, Palmerston North, Canterbury, and Fiji. Please contact us if you would like to attend a workshop, or organise an event in your local area. If you have a particular issue that you would like to approach from an Ekodo perspective, please contact us to discuss. We do not charge anything for our workshops except the cost of venue hire, travel, and accommodation (if any of these are required or cannot be provided in kind).